A business leader is required to be flexible in thinking and agile in action, and is needed to have clear philosophy and principles of management based on a world -wide perspective. Consultation on specific problem areas: finance, production, and human resource management in local environment as well as in overseas operations. We also dispatch consultants and instructors to in-house training programs. Performance evaluation and wage system for transforming human resource management system, etc. 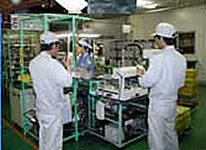 ChuSanRen is working with over 500 individual companies annually, to develop people and implement new management system.